Inspired by the beauty of falling flowers, this wedding headpiece features cascading florals reminiscent of the Wisteria flower. A contemporary palette of soft blush and champagne tones have a strong presence in this piece, framed by antique silver detailing. For lovers of subtle sparkle, it’s finished with Swarovski crystals that catch the light. Colours: Silver/ivory or silver/blush tones. MORNING MIST and MIDNIGHT crystal veils sold separately. The Wisteria bridal headpiece is made to order. Please allow 3-4 weeks for production plus delivery times. The Wisteria headpiece is a flexible and versatile design that can be manipulated to the shape of your bridal hairstyle or hair bun. Wear it in a half up/half down hairstyle to frame a veil’s comb, or position it above a bun for a classic and sophisticated look that’s feminine on all levels. If you’re envisaging a high set bun, the Lyric can be curved to frame the bun beautifully and set on top of a wedding veil. The Wisteria comb was designed to be worn with a veil – the metal combs are positioned at the ends of the headpiece which creates the perfect space for the veil’s comb to slip in between. 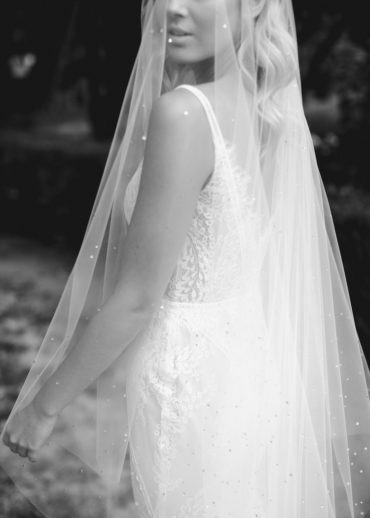 For a seamless and effortless finish, we adore the Wisteria comb styled with a long chapel or cathedral length veil. Browse our full veil collection or contact us and we’d be happy to offer a recommendation to suit the Wisteria based on your wedding dress and hairstyle. Details can be reworked into a new style – for example, a hair pin set, a smaller comb, delicate hair vine or a halo.